The 211 Lakeshore is not a 10 minute bus any more. 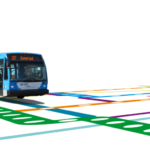 The STM chose instead to create a network of West Island express buses. 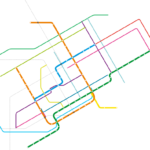 Some of these follow approximately the route of the 211, so many of the stops along that route may actually see frequent service to Metro Lionel-Groulx every 10 minutes. But the routes are not exactly the same, and the mess of that all is against the spirit of a frequent service map. The 132 Viau is now the 136 Viau. The daily pass needed to use the 747 airport express now costs 9$. I also took the opportunity to enlarge the West Island, and improve the proportions west of the Orange line, and added the missing LaSalle commuter rail station. I again made a 600 dpi version, which can be found here, and a pdf. Filed under buses, data visualized, map, Montréal. Your map reflects perfectly the idea behind the 10max network. Have you thought about adding the 45 to Brossard on the map? I have thought about it. It does fit the 10 minute standard. But it’s the only line by the STL (i.e. different fares). Also, it’s only a shuttle that mostly connects to other buses, and not final destinations that people may want to reach (well, I guess there’s a parking lot). It would complicate the map without adding all that much. What would be your argument for adding it? Well, it isn’t that different than the 470 except that it’s operated by the RTL (which is difficult to show on the map, I admit it). It connects mainly to a parking and transfert point, but there’s also a big shopping center just across the street (Mail Champlain). and as a main terminus on the South Shore, it serves as much more than a simple transfer point. People meet there to catch Allo-stop, go drink at the Scratch, etc. It has also been there and frequent since at least 15 years (my recollection). If you’re to consider that network from a metropolitan perspective, there’s no reason to include the 470 and not the 45. And as we learned, it’s going to become a LRT soon and, at that point, it will virtually be a metro line. Mmmh. You make good points. I guess should re-consider adding it. But it may be difficult to put it in — so far all the buses have STM fares, except the commuter rail and the 747 bus. So the 45 would have to be listed separatedly somehow. And the space is constraint as well, one letter sized page. I’ll think about it. Expanded the WI which no longer has as much 10minmax service! 🙂 Would be fun if you could mouse over the various lines to see their ridership data. 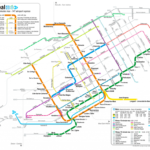 Lines like the 18 Beaubien and the 121 Cote Vertu are … amazing. 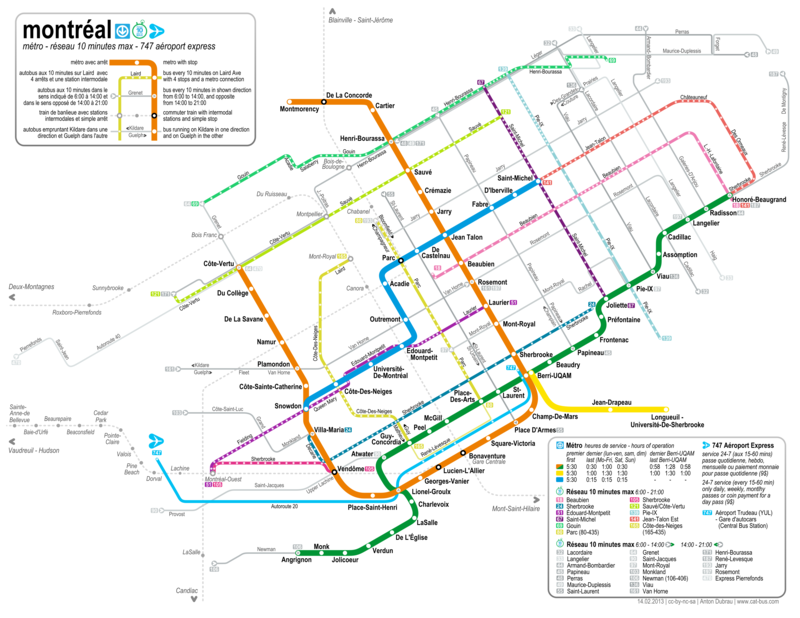 Thank you a lot for this, it helps to make sense out of the STM’s awfully confusing network. I must admit I leaves me completely flabbergasted that the STM can spend 200 millions on technological upgrades that most users will not likely use or notice, but they can’t be bothered to hire someone to make readable, sensible maps of their network like you just did… For free. It seems to me that the basic minimum to attract riders is to have a dependable system that is easy to understand, yet that is the one thing they don’t seem to care about delivering. The pdf is the original, not the newly-created one. Also, do you have an svg version of the new one too? It looks great!